This focused, highly practical publication analyzes important trends in patent, trade secret, trademark, and intellectual property law. 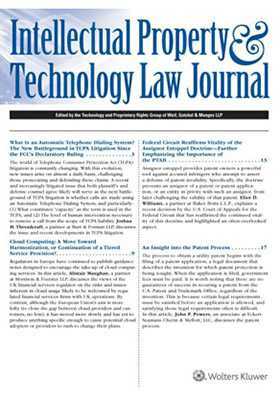 Intellectual Property and Technology Law Journal helps intellectual property professionals solve practical problems with "how-to" articles on such topics as exit interviews, investigating the activities of former employees or competitors, and conducting an intellectual property audit. Every issue includes articles by expert practitioners, executives, and consultants addressing judicial and legislative developments, overall business trends, practical security considerations, and international developments. Issues also include sample forms and agreements on essential topics that can be tailored for specific situations.